Tap "Ring Color" to cycle ring colors. Tap "LCD Color" to cycle LCD colors. Tap date area for Euro day/date. Tap "Mode" to cycle upper LCD panel time modes. In Chrono mode tap "Start" to start/stop and "Reset" to reset. Tap lower LCD panel to cycle modes. Tap Heart Rate panel to turn on/off heart rate monitoring. 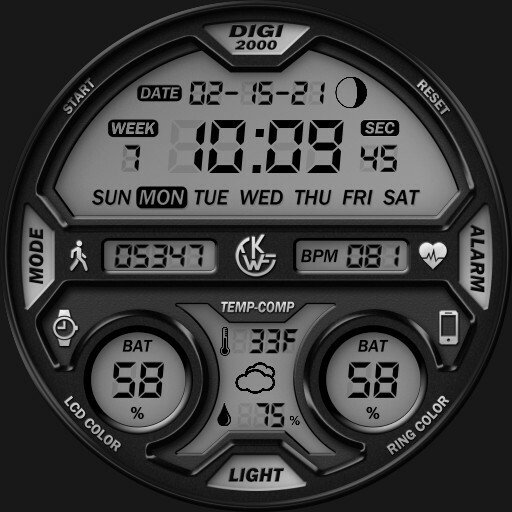 Tap Center logo for dim mode and dim style menu. Tap Style text to cycle Full Color, Black and White or Low Bit dim styles and Tap Mode text to cycle dim modes Normal, Always On Full Color Style Only and Off. Tap X to close.